Looks like 2019 is shaping up to be a banner year for spoilers on toys. 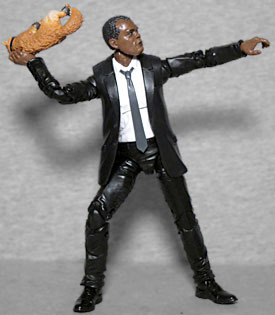 In the years following the Cold War, Nick Fury wrestles with this sense of purpose within SHIELD. When Nick crosses paths with Captain Marvel, they become Earth's only hope of stopping a Skrull invasion. It's weird that Marvel Studios has a functioning time machine, and the only thing they use it for is to go back and get younger versions of their actors to appear in their films. Do you think they collect the actors and bring them forward, or do they just take all their cameras with them and shoot the scenes back then? You know, to minimize exposure to future knowledge. All joking aside, Captain Marvel looks like it's going to push the limits of the de-aging technology - the whole thing is set in the '90s, so rather than just a single scene, Nick is going to have to be youthasized for the entire thing; if the effects slip even once, the illusion is going to be ruined. Fortunately for the digital artists, Samuel L. Jackson was kind of everywhere in the 1990s, so there's plenty of reference material out there for how he's supposed to look. Unfortunately, this toy seems to lean more toward "late-90s/Mace Windu" Sammy Jack than the "early-90s/oh-right-I-forgot-he-was-in-Loaded-Weapon" Sammy Jack the movie looks to be going for. They even gave him his Zeus Carver hairline, which is further back than Nick Fury's should be (as seen in the artsy portraits and actor photos on the back and sides of the packaging). 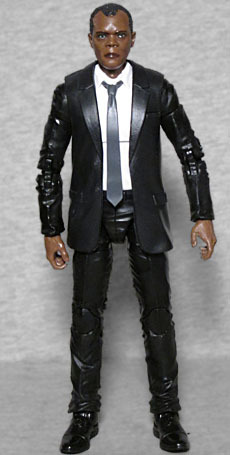 At first glance, this appears to use the standard suit body, but there are a few differences. For one thing, the chest is new: if you open up the jacket and look inside, you'll see that Agent Fury is wearing a holster under his coat. It's fully sculpted all the way across his shoulders, but you'll never even see a hint of it unless you get curious. 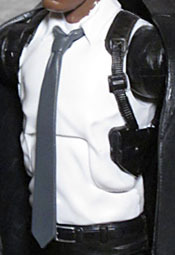 His tie is a new mold too, because he wears it slightly loosened instead of up tight against his throat. Something else that's new? The ankles. Hasbro finally listened to our complaints about the weird in-turned feet, and fixed the problem by adding another swivel where the legs go into the pants. At last, people wearing suits will be able to stand like human beings stand! Now maybe look into why this body was made pigeon-toed in the first place. All the other joints are the same as usual - head, neck, shoulders, biceps, elbows, wrists, chest, waist, hips, thighs, knees, and feet - so you'll be able to get him into all sorts of dynamic poses. Nick carries the same blocky pistol the last Nick Fury figure had, and then also this toy's spoiler - you didn't think we were just referring to the fact that he's probably going to lose his eye in this movie, did you? No, he comes with Carol's cat, and since the cat has weird golden eyes and is wearing high-tech restraints, it seems pretty apparent it's an alien - will the MCU try to explain what a Flerken is, or is this just a disguised Skrull sent to keep tabs on her? Ask us again in a month. For now, the kitty is designed to be held by the scruff of the neck, with its skin shaped to fit into Fury's right hand. The figure also comes with a piece of the Kree Sentry Build-A-Figure: a big right arm. Nick Fury's face isn't as youthful as it should be, but this is still something new. It would have been really cool if they'd taken a cue from Mattel's WWE toys and done swappable arms, so we could have a more casual Fury with his jacket off, but the torso probably would have looked weird.